If you have a question that you would like to see here, please submit it using our contact form. What are my options for a funeral, burial, or blessing for my baby? Where can I bury my baby? How should I bury my baby? What do I do if I don’t have a body to bury? If you intended to have your child baptized, your local ordinary will likely allow a funeral (cf. Canon 1183.2). It is not required that you have a funeral, but the option is open to you. The Funeral Rite for Infants is able to be used for any child, regardless of age. You can request a funeral, memorial service, and/or burial service through your parish priest or pastoral associate. Support in these ways can help you, as well as others you include, acknowledge and contemplate the meaning your child’s life and death. Even if your child died long ago and you no longer have his or her body, it can be incredibly healing to have a memorial service. Ask your local priest and often they can do this at your own home or at a church, wherever you prefer. A few things you may want to consider as you prepare for a service: Who will be asked to attend? Do you have any items you would like blessed (photographs, a journal, baby’s footprints, etc.)? The preparations will be completely up to you; plan it the way you want it. You may also simply request a blessing to be said. There is a a specific one you can request from a priest or deacon, called “Blessing of a Couple after a Miscarriage,” from The Liturgical Press’ Book of Blessings, which the Church uses to “assist parents in their grief and console them with the blessing of God.” We have a link to it at the top of our Prayers and Liturgics page, along with many other prayers you might want to include. You may want to schedule an annual Mass said in memory of your child by having the child remembered in the Mass intentions. You could also consider starting a yearly community-wide memorial Mass for miscarried and stillborn babies. It can be very comforting to meet and pray with other families who have experienced the same grief. 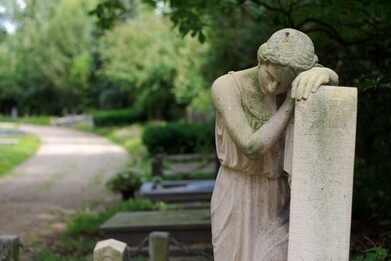 A cemetery is the recommended place for burial of your baby’s body, as it will ensure respect for his or her grave. It is highly discouraged to use your own property, as you may move, or other circumstances could cause problems (fire, animals, etc.). Church cemeteries often have a special area set aside just for babies, which are usually free of charge (donations are obviously welcomed). If not, you can inquire about a small plot or a location near a family member’s grave. Public cemeteries may also have a special baby area, or might allow parents to bury a baby at the foot of another family grave. Some cities even have cemeteries only for babies. Your local priest or funeral home director should be able to help make this decision. Purchasing an entire plot is not necessary. If you do decide to bury your baby on private property, be sure to check with the local department of health about burial regulations. If you would like a casket, you can purchase one through either your local funeral home or online. Funeral Homes: Once babies are past 20 weeks (this varies by state), they are often considered a legal person and the funeral home can do a normal funeral and burial. If your baby was born before that point, often funeral homes will provide a baby casket free of charge. If you speak to your priest or pastoral associate, they should be able to give you the name and number of the funeral home they typically use. Most of the caskets available through funeral homes are newborn-sized (about two feet long) and may overwhelm the size of a very early baby, so if you would like something smaller, you can also purchase a casket online. Online: For a simple wooden casket for a first or early second trimester baby, we recommend using Faithfully Simple’s Etsy shop. This shop was started when a grieving mother visited this site and saw the need for an inexpensive wooden casket, which was required by her cemetery. Another option is Heaven’s Gain, which offers a variety of caskets in sizes divided by trimester. They also sell clear bottles to fill with water and use along with the caskets for younger gestation babies. You can also use any special container that you would like, although you should keep it respectful. You should also keep in mind that the cemetery may have regulations on the type of casket allowed (wood breaks down, while modern caskets use plastics and other materials that will resist decomposition). In addition, using a higher grade casket would allow for the option of reburial if desired in the future (for instance, once you have a family plot set aside). If you decide to go with something simple, craft stores and hobby shops usually sell small unfinished wooden boxes that can work well for caskets. Embellishing them can be as simple as folding a piece of cloth into the bottom. Putting a religious photo, icon, or crucifix in with the baby or affixing it to the inside of the lid is nice as is putting a cross somewhere on the outside. Depending on the gestational age of the baby, you can swaddle him or her in a small fabric square, enfold him or her in it completely or (if old enough) put on a simple shroud. Here is one source for crocheting your own burial gown for a stillborn child. There are many reasons why you might not have your baby’s body; for example, you may have miscarried months or years ago, or you miscarried so early that you were not able to distinguish the amniotic sac. This is similar to situations where soldiers die in war, accidents happen at sea, or other times when no body is recovered. You are encouraged to have a Memorial Mass or Memorial Service, either at the church or at your home. Having a blessing said over items you kept from the pregnancy or the baby’s death (a journal, photos, etc. ), as well as over yourself, can be very healing. If you would like to have some item as a memorial, many people use a stone or a cross. These can often be placed in the area of the cemetery that is reserved for babies. You should be able to work with your priest or pastoral associate to discuss all of your options. PLEASE NOTE: If you have guilt over this, please try to pray about it and move past it. Being unable to bury your baby doesn’t lessen his or her impact on your life or change the fact that he or she is an immortal soul who is loved very much. No matter how your child’s body is laid to rest, his or her soul is equally deserving of respect. Every human life is sacred, “from the moment of conception until death” (Catechism of the Catholic Church, no. 2319; cf. no. 2258). Remember, some saints’ bodies have never been recovered. Yes! This child had an impact on your life, and naming allows you to acknowledge his or her unique identity, as well as your own grief. You can pray for the soul of your child by name, as well as ask them to pray for you. Your child is now an intercessor for you, before God in Heaven, and a part of the communion of saints: according to the Catechism of the Catholic Church, “Indeed, the great mercy of God who desires that all men should be saved, and Jesus’ tenderness toward children which caused him to say: ‘Let the children come to me, do not hinder them,’ allow us to hope that there is a way of salvation for children who have died without Baptism” (no. 1261). If you are concerned that you might name the baby the wrong gender, try to find a gender-neutral name. Look at the day the baby died, the day you found out you were pregnant, or his or her burial date, and choose from the list of Saints who have that as their feast day.